Cleveland is a busy international seaport. 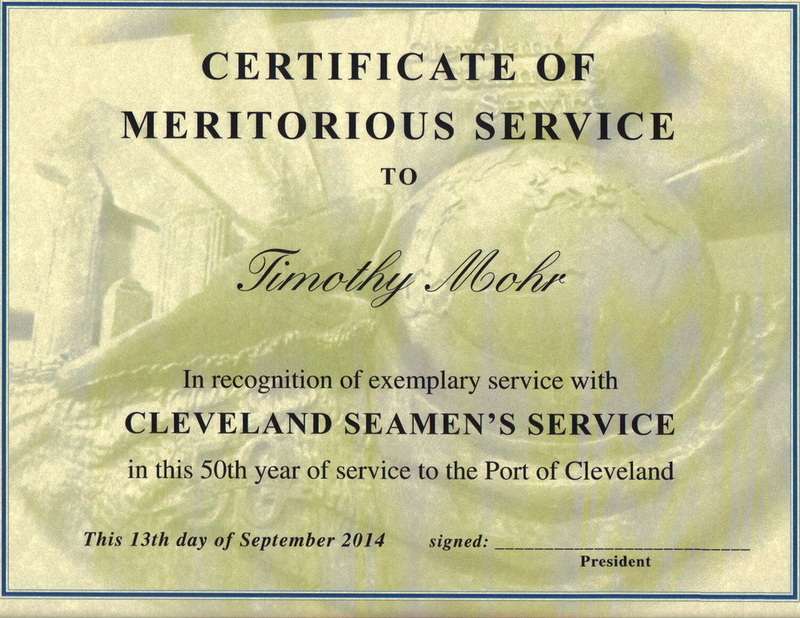 Seamen's Service is an organization made up of a dedicated group of volunteers that are ambassadors for the city of Cleveland, the state of Ohio, and the United States of America. 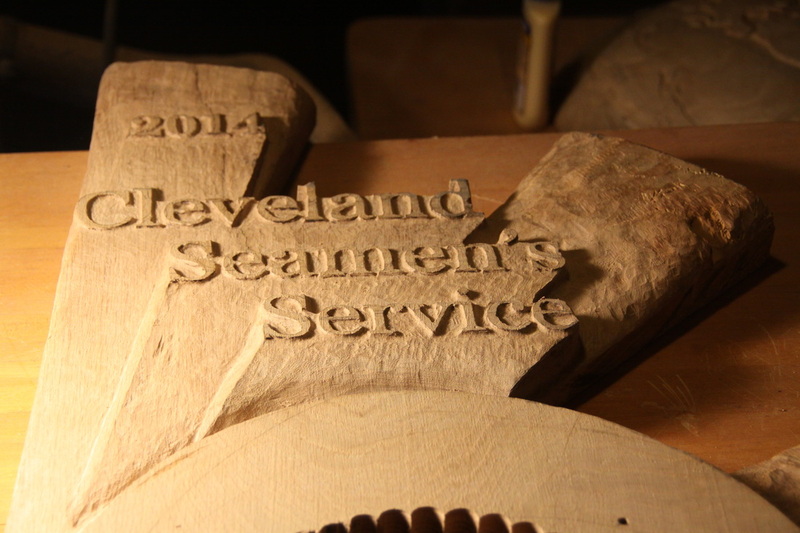 In 2014, seamen's Service celebrated 50 years of service. 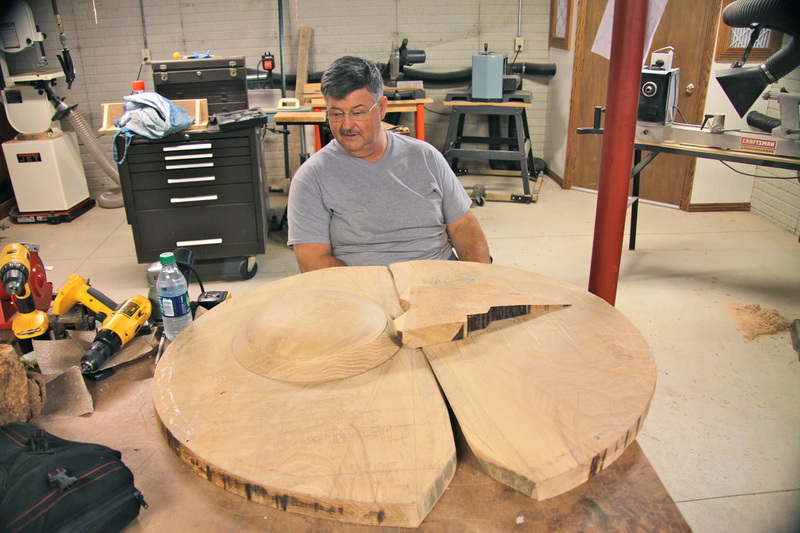 This tribute is 47" in diameter, 3-9" thick and is made out of native Ohio white oak. 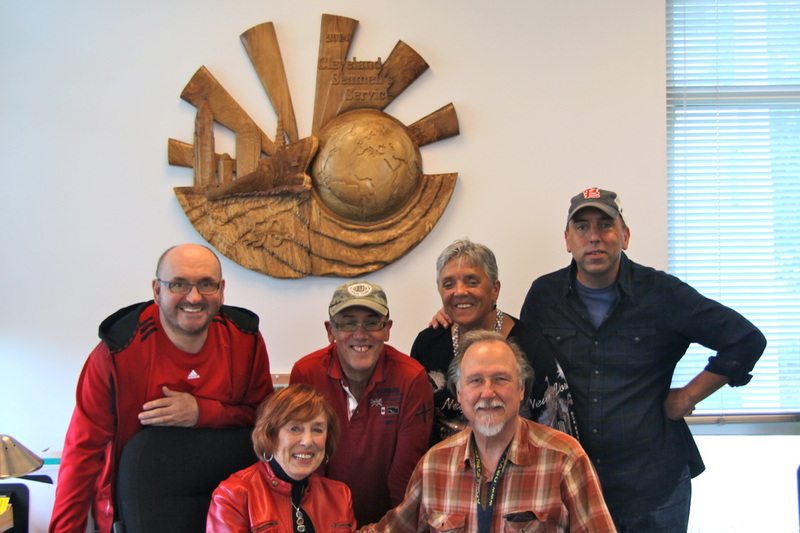 The 50th memorial on the wall of the Seamen's Service office with a happy crew in the foreground. 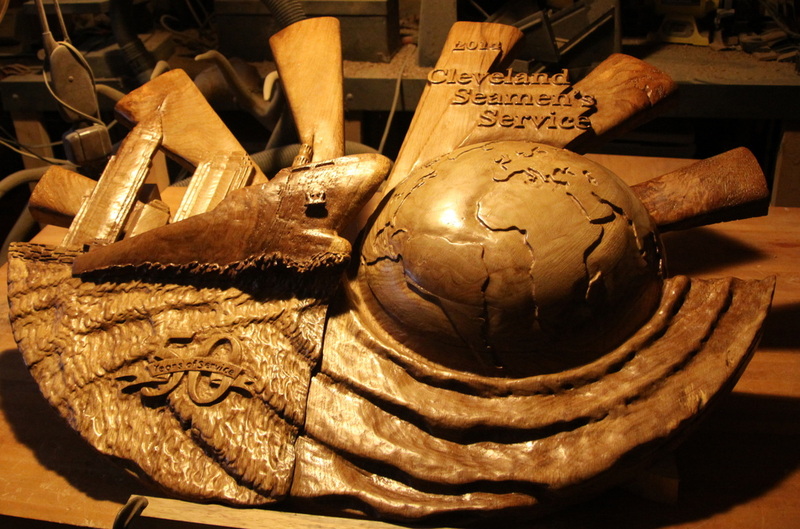 A photo of the sculpture was used as background for Cleveland Seamen's Service Meritorious Service awards. 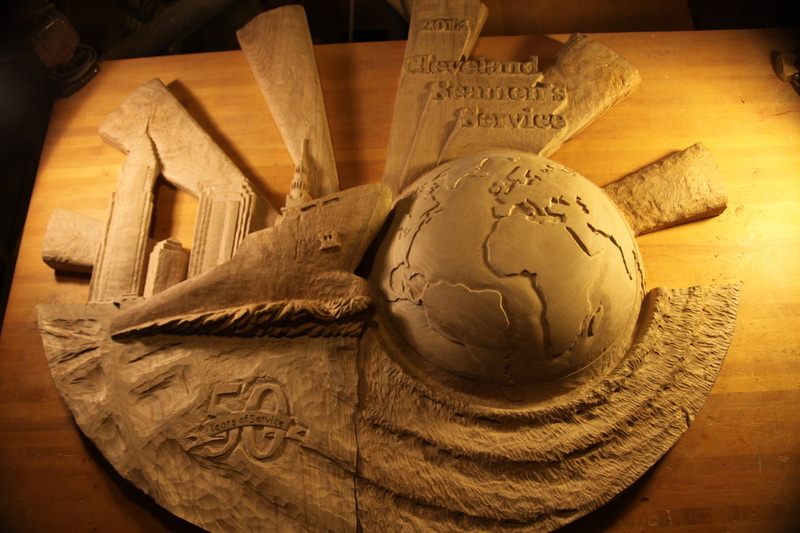 Scroll down to see the making of "50 Years of Service". 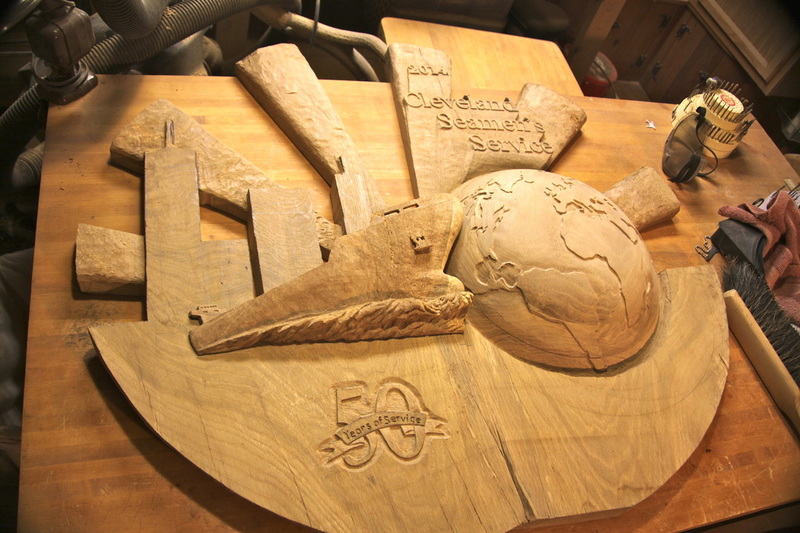 The nearly finished sculpture. Notice the effects of the water on the right. 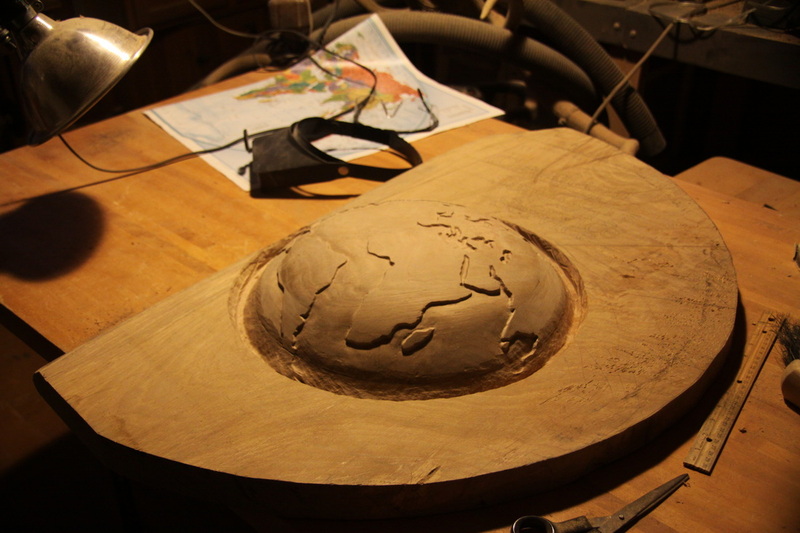 I decided the view from afar with the world as shown would show a much calmer representation of the world's oceans. 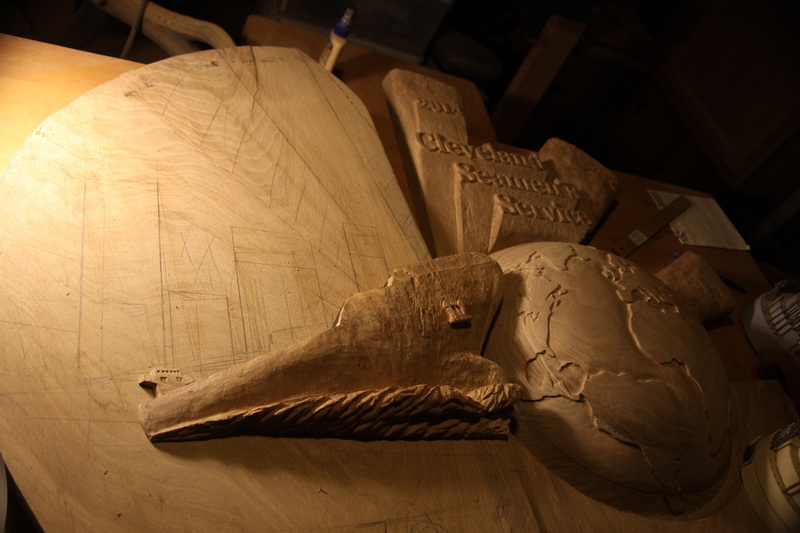 Blocking out the buildings that make up the Cleveland skyline. Drawing in the buildings and rays of the sun projecting from behind the skyline. 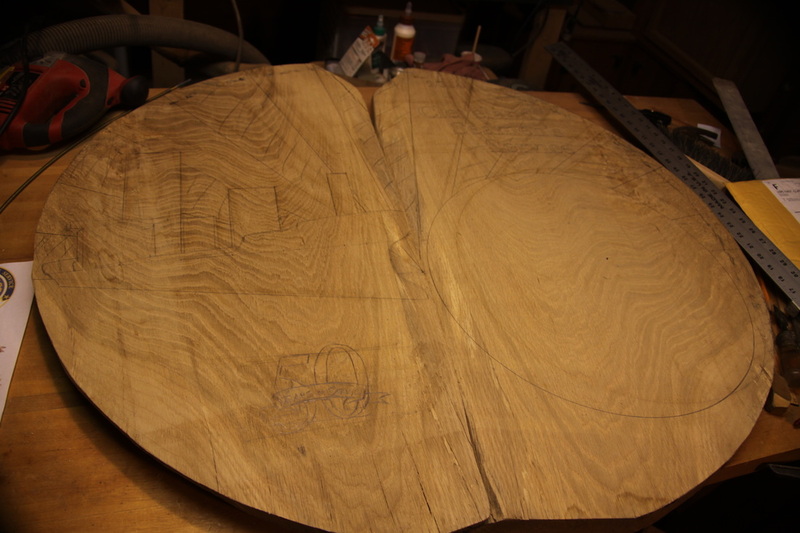 Carving out the lettering. I wanted this to appear as projected into the sky on the same diagonals as the rays of light. The world projects both out from and into the surrounding seas. 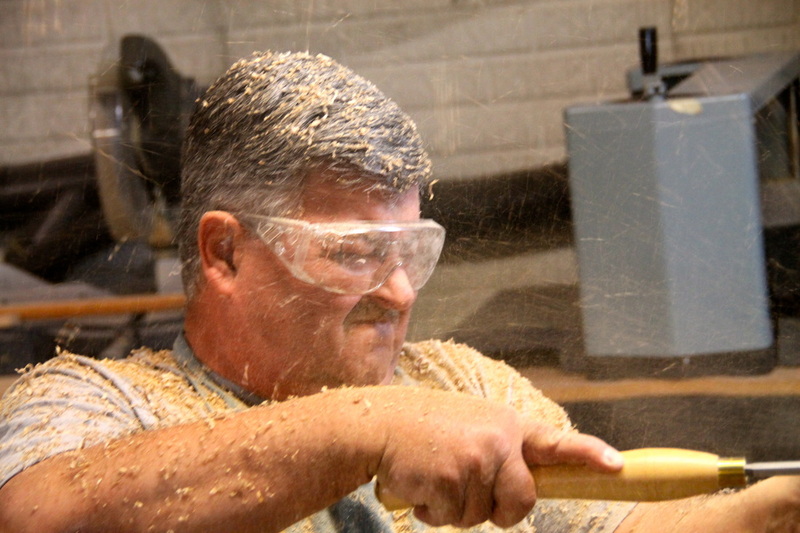 This adds additional dimension to the sculpture. Doyle checks out his handywork on the world and its orientation to the ship on the proposed design. 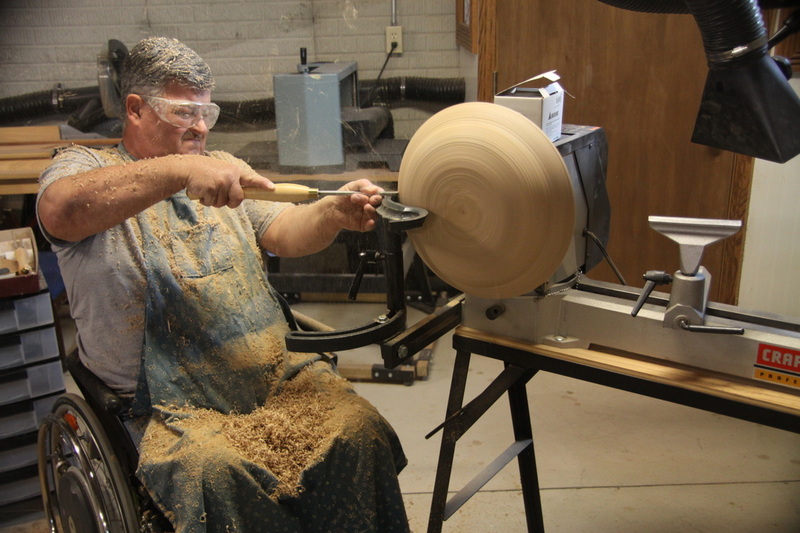 Good friend and fellow woodworker Doyle Harbaugh lends his lathe and his expertise to shape the world. 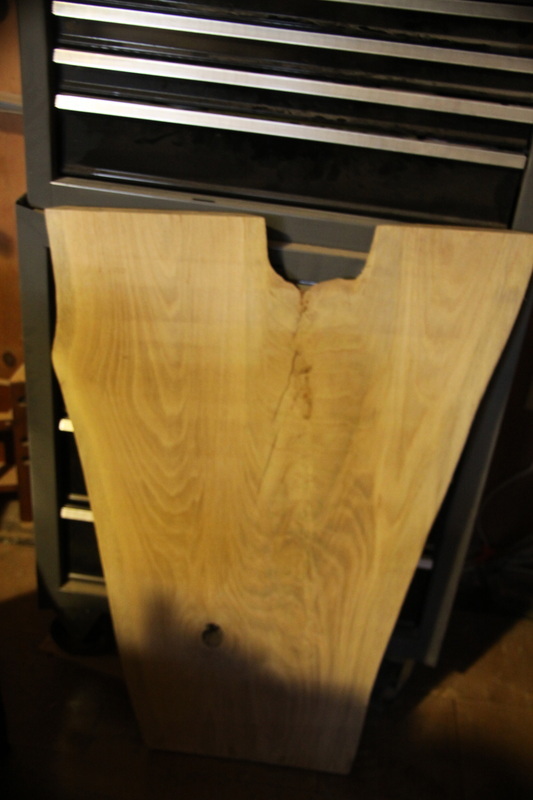 The layout takes form on book-marked slabs of white oak. 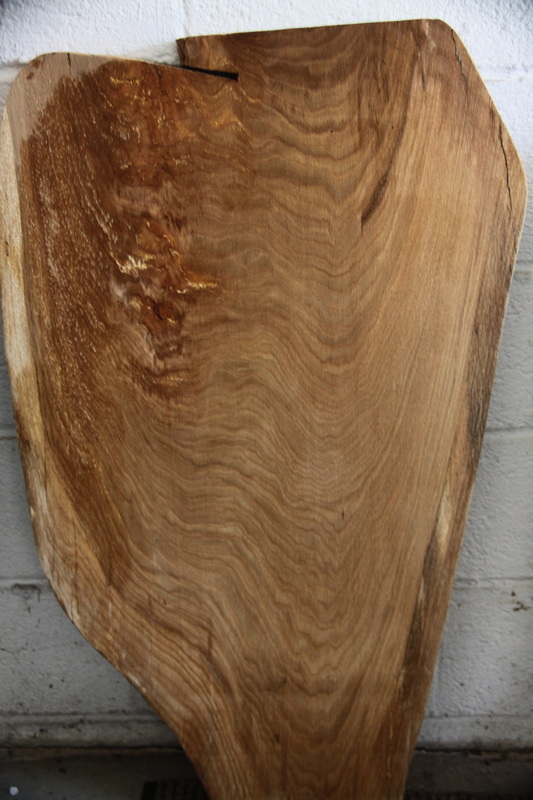 Special attention is taken to the "seam" between slabs so the ship will overlap to appear headed out into the world. 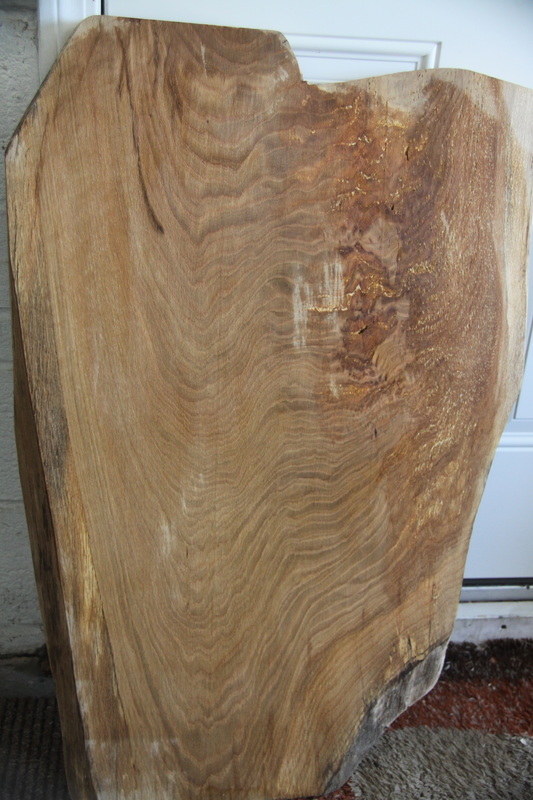 I wanted to use native Ohio wood slabs for this recognition of 50 years of service to international seamen to the city of Cleveland and the state of Ohio. I found these slabs at Ohio Woodlands, www.ohiowoodlands.com. 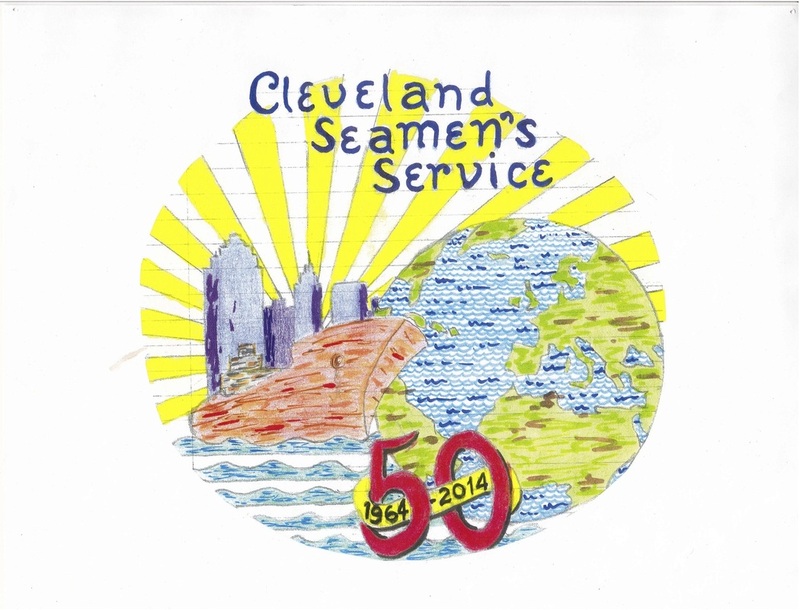 The original design idea for the 50 year tribute to Cleveland Seamen's Service.